/ Modified aug 10, 2016 12:25 p.m.
Tuesday's storm is not the end of wet weather for Southern Arizona. More storms will hit the area Wednesday, and the incoming weather system could bring substantial moisture. 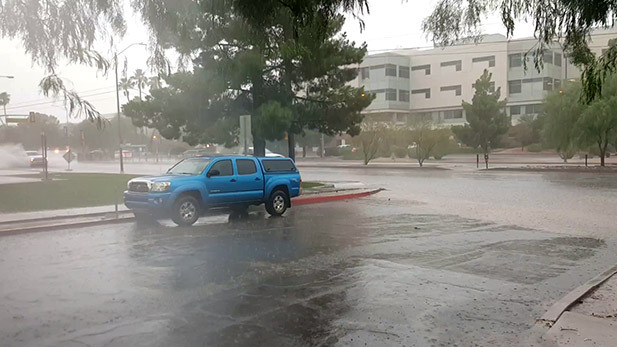 Any new rainfall could cause more flooding in the Tucson metro area. Drozd said the ground throughout much of the area has already soaked up all the water it can hold, so subsequent rain will more easily cause flooding. Parts of Tucson reported up to three inches of rain yesterday. That amount is about one third of the area's annual average total. Official measurements at Tucson International Airport showed 0.86 inch of rain on Tuesday. Areas of Cochise and Santa Cruz County received around four inches of rain, Drozd said. Public safety officials remind residents not to use roads that are flooded or closed, and one foot of moving water is enough to carry away most vehicles or knock people off their feet. In a press release, Tucson Fire Department said the department performed eight swift water rescues and responded to approximately 45 calls of vehicles of vehicles stranded in water.